I'm again writing this post on a Thursday, since this weekend I'll be on my annual girls' weekend in Grand Haven - two friends and I have booked a cottage in Grand Haven, through Airbnb. Grand Haven is one of my favorite Michigan cities so it should be a fun trip. We usually visit Saugatuck and the surrounding towns as well. Sweetwater's Donut Mill donuts, from Kalamazoo. Open 24/7! Eating a bit too much. And the scale is reflecting it, so after Grand Haven it's back to zumba for me - I haven't gone in 3 to 4 weeks because I had been sick. On Wednesday, I met up with a friend at Camp Ticonderoga (in Troy) for dinner, and had a delicious pulled pork sandwich with sweet potato fries. 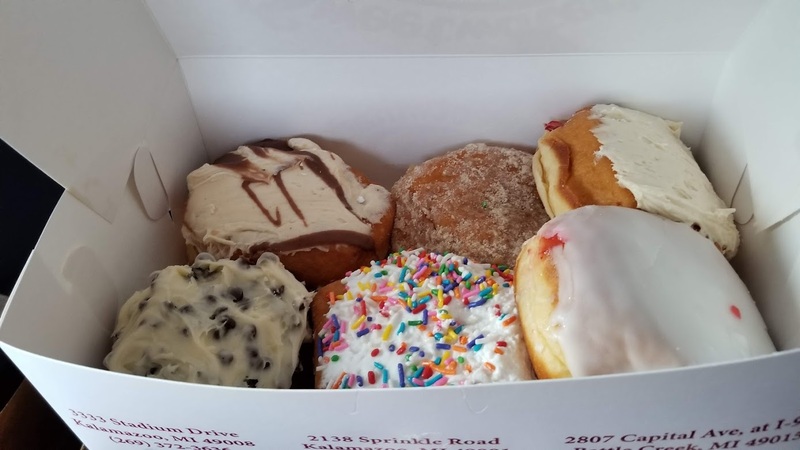 On Thursday, a friend and I went to Granite City (loooove their happy hour deals) before seeing Wicked downtown, and since I was in Portage/Kalamazoo last weekend we ate a lot as well (like those donuts, pictured above). 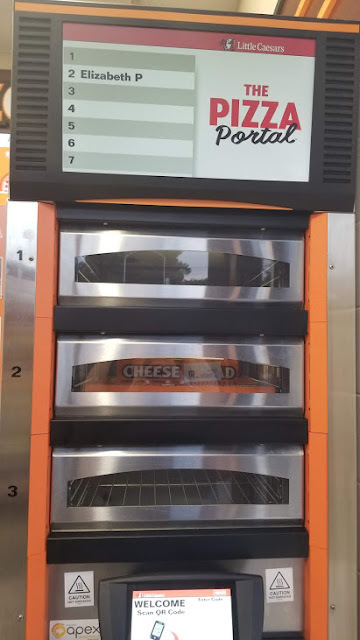 On the way back from Portage we stopped at Little Caesars for takeout, where I encountered their Pizza Portal (see pic below), which was actually very fun and high-tech ... I had ordered my pizza online and LC emailed me with a code to use to open the portal. I haven't done LC takeout in ages so I'm not sure how new this is, but my boyfriend and I got a kick out of it. Traveling. Last weekend we went to Portage to visit a college friend and her husband, and we had a fun time playing lots of games (board games, Nintendo Switch Tetris and Mario Kart, etc.) as well as eating a lot. We did homemade fondue one night too which is always fun. Living without A/C (for one night). I learned how much I take my A/C for granted when I got home Monday night from work and realized it wasn't working. It was about 75 outside when I went to sleep so I couldn't open the windows, either. I have a ceiling fan in my room and I dragged out an old personal-sized fan from college, too, so it wasn't too bad, but luckily it's now fixed. Seeing movies. MoviePass will soon be transitioning to only 3 movies per month (same price, $9.99/month), and although I'll probably be keeping my membership, my new plan kicks in on 8/24 so I'm hoping to see as many movies as I can before then. This week I only had time for Christopher Robin, which was very cute but I wanted it to be better ... I'd give it maybe 3.25 out of 5 stars. Next week I am hoping to see Crazy Rich Asians, The Meg, and BlacKkKlansman. I figure I can supplement my MoviePass with $5 Tuesday movies at MJR Troy but if there are still more I want to see, I may switch over to AMC's $19.99/month plan (3 movies per week, can book ahead of time, and 3D and IMAX movies are included). I enjoy MJR Troy a bit more than AMC John R, though (my local AMC theater), so we'll see. Cooking. This week my subscription box of choice was Martha by Marley Spoon, as they offer a tempting deal for new subscribers: $18 for two meals (four portions total). On Tuesday night I cooked a tasty steak with a cucumber + beans salad and toast, though I unfortunately burnt the toast—you had to cook it under the broiler and my broiler is hard to gauge, sometimes.. On Monday night I cooked my remaining Dinnerly meal, which was spicy Italian sausage with pasta and caramelized onions; the sausage and the caramelized onions were delicious, but the pasta itself was just okay.